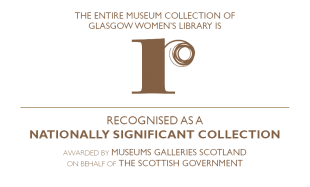 Glasgow Women’s Library has worked with hundreds of artists, writers, storytellers, facilitators, trainers, filmmakers and other inspirational colleagues over the past twenty years. Kate Davis and Faith Wilding are internationally renowned women artists who collaborated with GWL on their exhibition The Long Loch: How Do We Go On From Here in 2010 and who worked with us on the migration of their Feminist Lines of Flight web resource to the GWL website. Heather Middleton facilitates the GWL Book group. She is a fanatical bibliophile and a graphic artist, and in this capacity she was recently commissioned to create a series of new images for the West End Women’s Heritage podcast. She has taken on a new role this year, editing the third of our Women’s Heritage walk maps – the focus for this trail is the Glasgow Necropolis. Kirsty Hood is one of our tour guide team and is also responsible for editing the first two women’s heritage walk maps. In her regular job she works for Glasgow Museums. Nikki Bell and Simon Haslam are directors of FMR Research. Their company is currently working with GWL to develop our raft of podcasts as part of the Library’s social enterprise initiatives. Mick Reilly is the creative director of Root Creative. Mick is heading up the revamp of GWL’s website in collaboration with the Library team. Elaine Kordys is a filmmaker and artist. She has worked with GWL in the creation of the One Small Step video, our literary video podcast, Women’s Words, and has trained the GWL team on documentation skills. Ian Corcoran is a graphic designer who has worked with GWL for several years and created annual reports, newsletters, banners, bags and other design work. Adura Onishile is a performer and facilitator who performed at The Traverse Theatre, The National Theatre and the Royal Shakespeare Company. She is working on a production, ‘Girl’ initiated by Ankur Productions in partnership with Glasgow Women’s Library.